On 13th May, everyone enjoyed the sun shine and spread out meadows at Kadarkantha camp site and we were raring to go at Kedarkantha peak. We started at 8.00AM for the 2000ft climb eastwards. 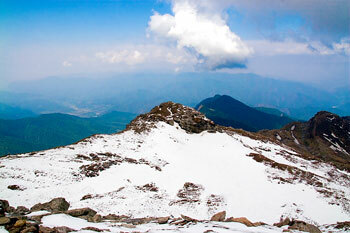 The climb proved to be the most difficult ascent in he whole trek. It was not only steep but later half of the ascent was on loose snow. 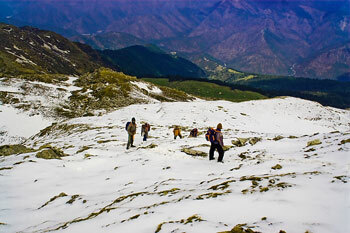 Realization: Walking on Himalayan slopes and snow is different from the way we have learnt to walk. It is not hop-step-and jump � you don't take a step as a grip for the next step and so on. You take a step so that you can support yourself (stand confidently) for some time. Do not take foothold for granted (like on planes) � As you place the foot, assess the strength before rooting the foot firmly or taking back the step. This is possible only with small steps. Do not root a part of the foot in odd angles � rest your foot firmly and wholly. In the altitudes where there is less concentration of oxygen, efforts put per breath should be low with obviously as much gain as possible. So once again smaller steps may help. Once on the peak at about 10.30AM, you can see the surrounding peaks provided the weather is clear. For us the weather spared us for a few minutes and soon the surrounding areas were covered by the clouds. On the Kedarkantha peak, there is a Siva temple believed to have built by Pandavas (Bhima is said to have arranged the stones of the apparently unfinished temple). Pandavas were trying to build a temple for Siva that would be called Kedarnath temple, nut midway through the bull Nandi upon hearing mew of a cow ram away searching for its mother and stopped only at what is now known as Kedarnath. The guide would show the four peaks that are the landmark of the area we were trekking in � Char Khamba, Har-ki-doon, Swargarohini, and Bandarpoonch. Though the weather was threatening to worsen we waited for all our team mates to arrive and have some rest before starting for a northward trek. When you look down from the peak towards east you can see the Doondha camp site. Earlier the trek used to be direcly to dhoondha, but acting on the feedback of the participants, YHAI has avoided long and difficult trek directly to doondha and instead introduced an intermediate campsite towards the north of the peak � Luhasa Thatch. If the ascent on loose snow was difficult, the descent on the loose snow is much scarier. Keep in mind the fundamentals of walking in snow and you will soon be at ease. As you climb down the peak on the crest of the mountain ridge covered with snow, you will be so occupied with anxiety of getting the next foothold right, that there is every chance of missing on the grandeur of Himalayas on either side of the ridge � huge mountains running almost parallel fully covered with snow. Very few people muster up the courage to take snap of this wonderful sight. Tea is made available at lunch point and you will be surprised to see the support staff of Kedakantha camp at the tea point preparing tea and omelets for the participants. Carrying their vessels and wood they take a shortcut and arrive there well ahead of the participants. Tea costs Rs 10/- and an omelet Rs 30. It had started to drizzle by the time we reached at lunch point. After a quick lunch we set forth mainly to beat hails that would start any time after noon. After a short distance of the continuing difficult terrain we reached a point where we came to a long and steep slope (100 meters and more), where the guide assessed the depth of snow cover, using his ice cutting axe. According to him the layer of ice / snow was more than two feet. This made possible the most enjoyable part of the trek � we could sit and slide down the slope of the hill an experience of few seconds that may last for ever in your memory. Every one enjoyed the slide. After that it was relatively easy trek to Lahusa Tatch campsite and we reached it by 1.45 PM but not before walking through a small hail storm. 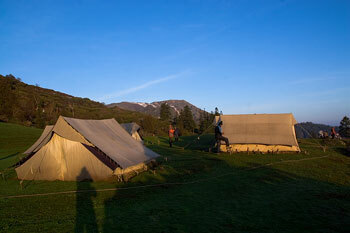 By 3.00 PM, a pleasant surprise unfolded before us, fine sunshine around the campsite. Fortunately for us our friends from Kerala with whom we were sharing the tent had every thing that was imaginable at those heights � a nylon rope � which tied out side for drying up our wet clothes. 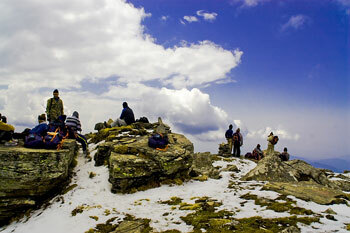 Each one of us virtually bathed in that soft sunshine and was really a luxury after that difficult trek. What we saw, in general, was that at heights above 10500ft it was all snow and rarely did we see a stream. Weather gets inclement even before noon and that there is no vegetation. That is exactly the reason, why we are brought back to an altitude of 10500ft from the height of 12200ft of Kedarkantha peak. Luhasu Tatch is amidst trees and so more comfortable for stay. May 14th, our experience with soft sunshine continued as we had opened the backside flaps of the tent to enjoy the sunny morning.